Experience and Qualifications: While attending law school in Washington, D.C., I had the honor of working at the Pentagon for the Chief Attorney of the Army, where I handled Freedom of Information Act requests, as well as government contract applications. Also while in D.C., I worked at the United States Department of Justice in the Asset Forfeiture and Money Laundering Section of the Criminal Division. After law school, I returned to Connecticut in 2003 to begin my legal career in the Judicial Branch of the State of Connecticut, where I worked directly with judges throughout the state in conducting research and assisting in drafting legal opinions and decisions. Thereafter, I worked at a small law firm where I represented plaintiffs in civil actions. The majority of my legal career (2006-2015) was spent at a reputable law firm in Hartford, where I was a civil litigator who defended businesses and individuals in civil actions that involved professional liability claims, construction defects, personal injury and employment-related claims. 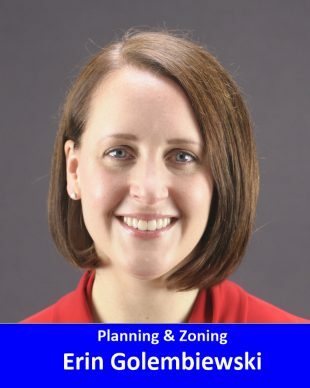 The twelve years I worked as an attorney provided me with invaluable and advantageous tools that would benefit our community if I am elected to the Planning & Zoning Commission. When faced with an application, I will use my skills as a legally educated, critical and meticulous thinker to analyze the facts in conjunction with applicable regulations. Education: I received a Bachelor of Arts Degree in Psychology and Criminal Justice from the University of Connecticut in 1999. In 2003, I received a Juris Doctorate from the Catholic University of America, Columbus School of Law. Family: I grew up in Massachusetts and Connecticut. For the past twelve years, I have resided with my husband (who is my high school sweetheart) in an almost 200 year old house in the beautiful historic district of our town. We have lovingly restored our home and brought it back to its former glory. We have three wonderful children: our son, Logan, is 5 ½ and will start the first grade at A. Ward Spaulding School in the fall; our son, Aiden, is 2 ½ and will be starting part-time preschool early next year; and the newest addition to our family is our baby girl, Cameron, who is three months old. I am currently a stay at home parent. I want to serve on the Planning & Zoning Commission because it would be an opportunity for me to give back to our wonderful community. I believe my educational background and legal training have provided me with the tools and characteristics that the people of our town will find invaluable in a newly elected member of the P&Z Commission. I want to put my training as a litigator, along with my love for this town, to work on the commission to ensure that the agricultural, historic and residential nature of Suffield remains intact, with the understanding that a fair balance must be struck between preservation and progress. Understand that a certain level of progress is a step in the right direction for the growth of our community, as long as it does not damage the fibers that make up the fabric of our town. I appreciate your support and encourage you to vote in the November election.